Oh my! What a believable story. What can I say, I'm a comic book fan since childhood. Could not put this story down. 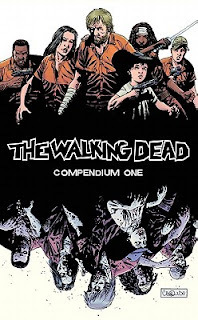 And feel lucky that I started with Compendium 1 and rolled immediately into Compendium 2. I blew threw the first 96 comic books back to back. I watched the series before I started the graphic novel. And I continue to enjoy both. They have very different story lines, yet they follow the same characters and have very similar settings. What is nice; one does not "ruin it" for the other. Even when the two stories converge on the exact same moment, they then immediately diverge in different directions just as fast. My advice is not to fret, and if you're like my wife you can read and watch at the same time. Then you can get caught up, and wait for the next comic book and season 3 with me. Comics, the next best thing to falling asleep reading! Glad it won't wreck the show cause I love my Walking Dead - Going to start reading it!! Thanks Neal! I was waiting to read it cause I didn't want to wreck my show...cause I love my Walking Dead! So for which thing you people are looking today? Its kiss day so according to me you must be looking for premium kiss day stuff, isn’t it? It is something like Happy Kiss Day Images, Happy Kiss Day Wallpapers, Happy Kiss Day Greetings, Happy Kiss Day Cards, Happy Kiss Day ClipArt, Happy Kiss Day Wishes, Happy Kiss Day Quotes, Happy Kiss Day Poems and etc.